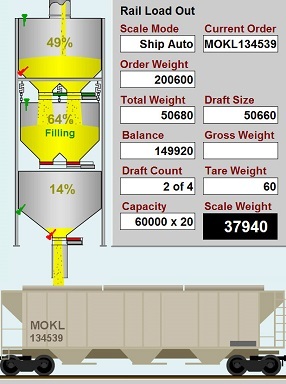 Bulk weigh loadout system installed last year at Bunge North America Inc.’s rail-loading terminal at Waterloo, IN, which includes a 60,000-bph CompuWeigh bulkweigher. Photos by Ed Zdrojewski. St. Louis, MO-based Bunge North America Inc. traditionally has been oriented toward shipping grain by barge on the river system to the Gulf of Mexico. But when Bunge acquired several grain handling facilities in the eastern Corn Belt from Central Soya in 2003, it required a shift in thinking. The Central Soya elevators, including the former 2-million- bushel Dekalb Agri elevator at Waterloo, IN (260-837-2900), had been geared toward shipping grain by rail to the large poultry and swine markets in the southeastern United States. According to Plant Manager Loren Keske, Bunge inherited a bulk weigh loadout system capable of moving 25,000 to 30,000 bph of grain, good enough to load the 50-car unit trains that the Norfolk Southern Railroad (NS) offered at the time. However, the NS was offering improved freight rates for 75-car trains. Bunge decided to upgrade the facility’s railloading capabilities in 2004. The centerpiece of the upgrade was a new 60,000-bph bulk weigh loadout scale manufactured by CompuWeigh Corp., Woodbury, CT (203) 262-9400. The upgrade also include the addition of more siding track to accommodate more hopper cars and related grain handling equipment. The contractor on the project was Grubb Construction Inc., McComb, OH (419-293-2316). The project was completed during the summer of 2004. CompuWeigh had the manufacturing flexibility to customize the scale for the Waterloo facility’s needs.The CompuWeigh scale included a customized upper garner holding up to 2,000 bushels, which gives the operator time to continue the grain flow in the event of a short delay in moving the railcars. CompuWeigh was able to adapt the Waterloo facility’s existing PLC software, and the Mettler- Toledo JagXtreme software interface to the company’s AGRIS grain accounting software. 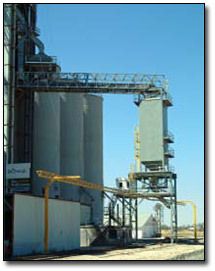 The project also included the installation of two 60,000-bph Hi Roller enclosed belt conveyors. Allen comments that Bunge has long admired Hi Roller’s innovative design. In between the two conveyors is a 60,000-bph GSI leg. Allen says he likes the GSI equipment, in part, because the equipment’s powder- coating system improves longevity. The loadout system utilizes an InterSystems sampler.As an option, a 40,000-bph InterSystems gravity screener also was installed.